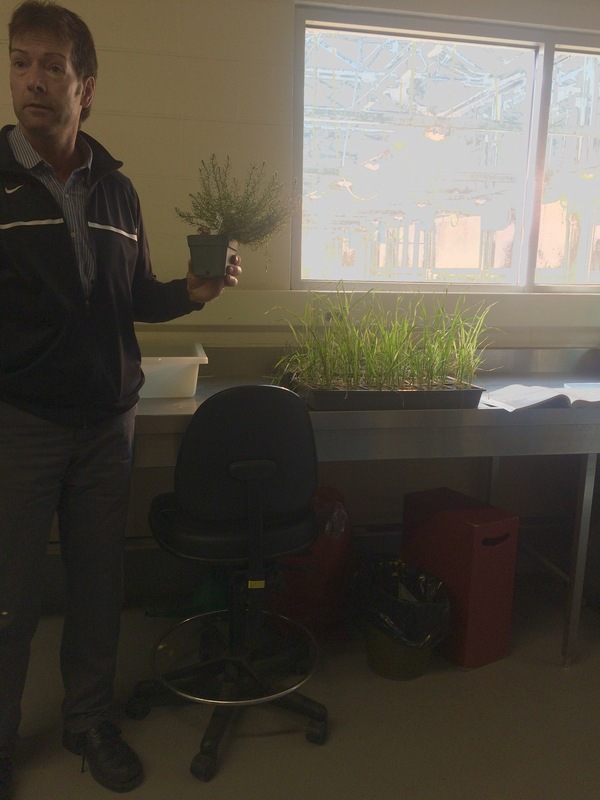 Our day started at the Saskatoon Research Centre with a brief overview of the facilities operations. Here we are learning about certain pests that threaten the crops in our area. 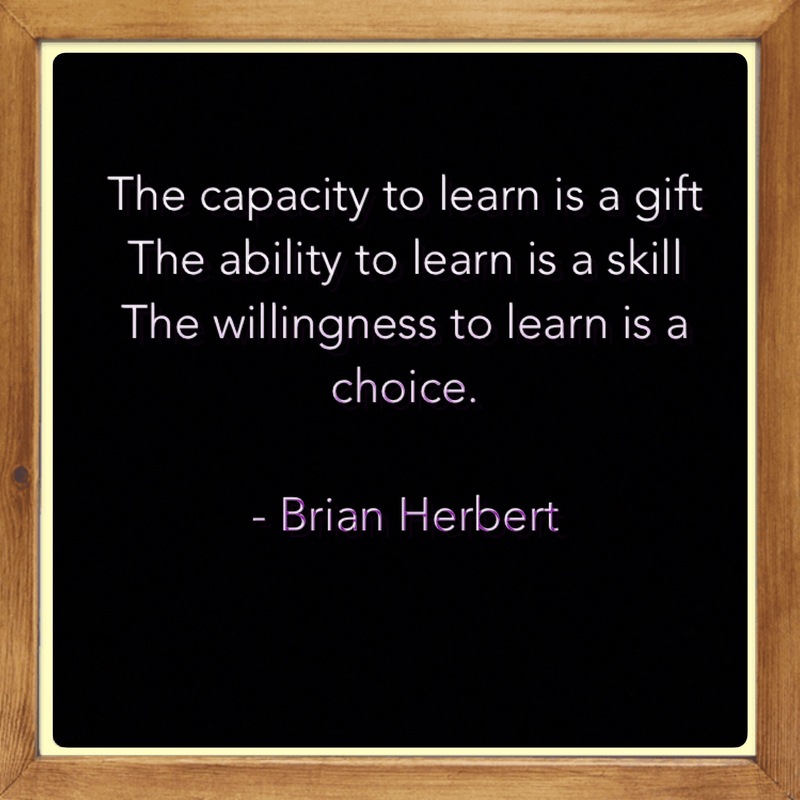 Some of which the kids have experienced in their field plots. 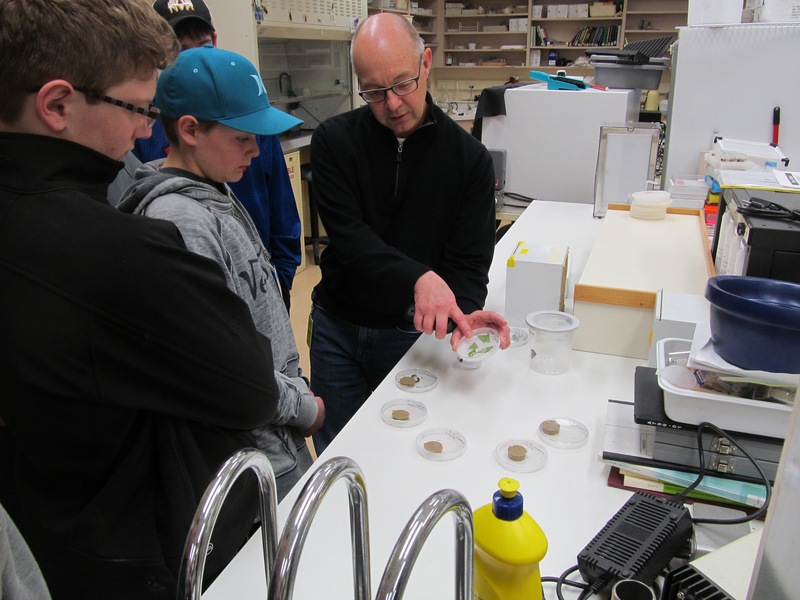 Dr. Martin Erlandson talked a bit about the seed saving program at Ag Canada; how they have both new and many ancient strains of seeds to run experiments with and how they have to periodically test them for viability and germination. He also touched on the seed saving program and facility in Norway. 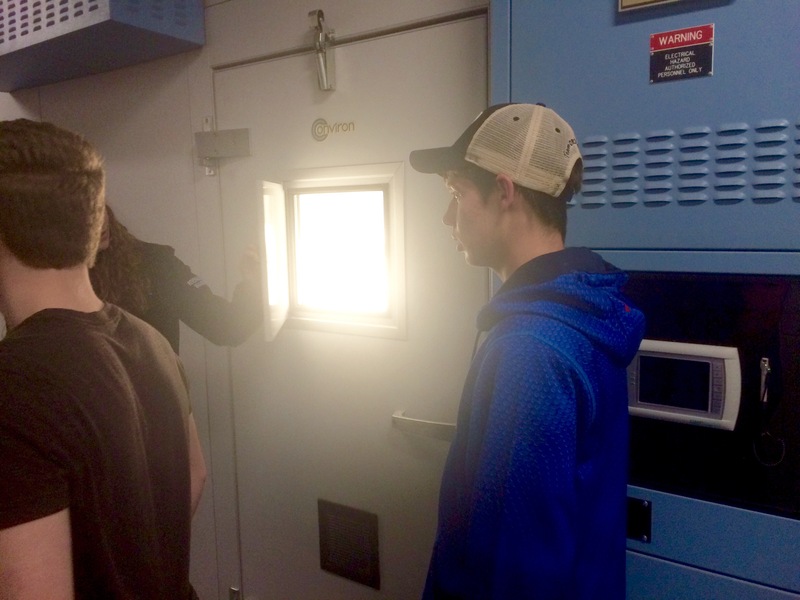 Ross Weiss, Senior Entomology Technician, is showing us a controlled environment facility or growth cabinet (above) and the Thermal Gradient Plate (below). 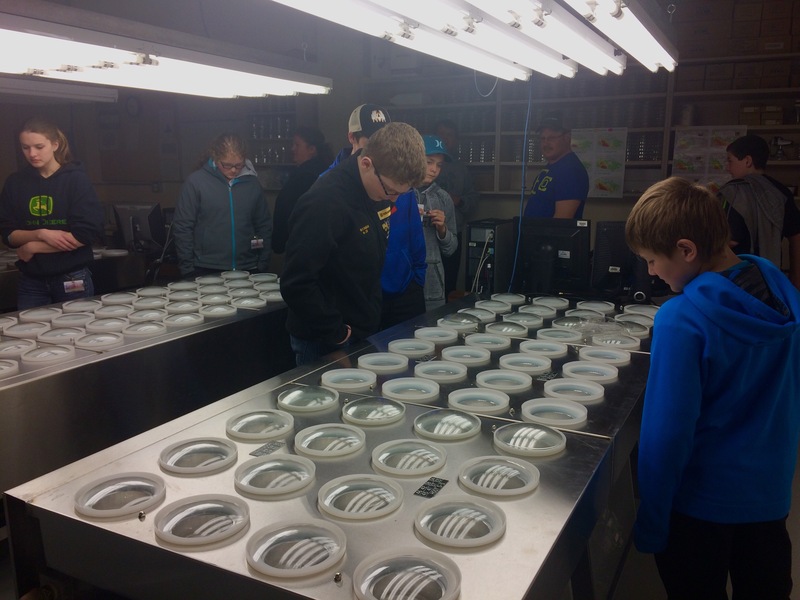 The temperature of each separate cell or pod can be controlled and changed throughout the day, enabling the researcher to chart optimal growth for different varieties under different conditions. 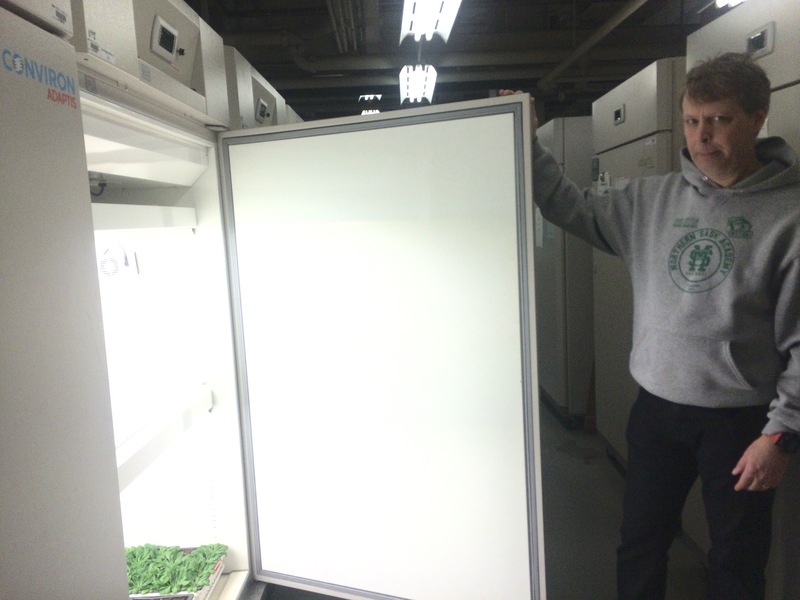 The growth cabinets that are often used in these types of studies provide one constant temperature which does not accurately portray growing conditions here on the prairies. Near the equator the temperature is more constant but here temperatures can fluctuate a large amount in a 24 hour period. A lot of the work done in this lab is tied to climate change (with widely fluctuating temperatures becoming more common) and researchers from around the world often visit to see the thermal gradiant technology because this is the only one in existence. 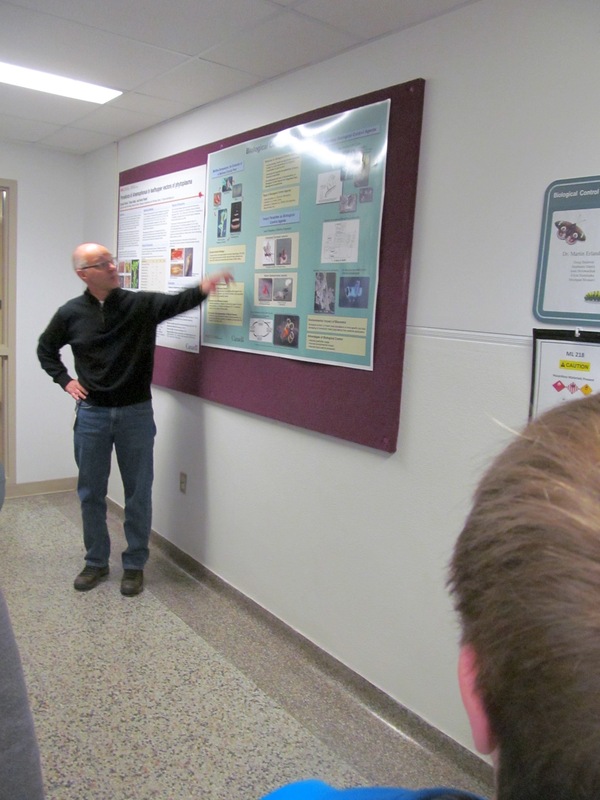 Dr. Hugh Beckie, Research Scientist (weed ecology and herbicide resistance) is describing his work on glyphosate resistance and some of its implications in our farming area. 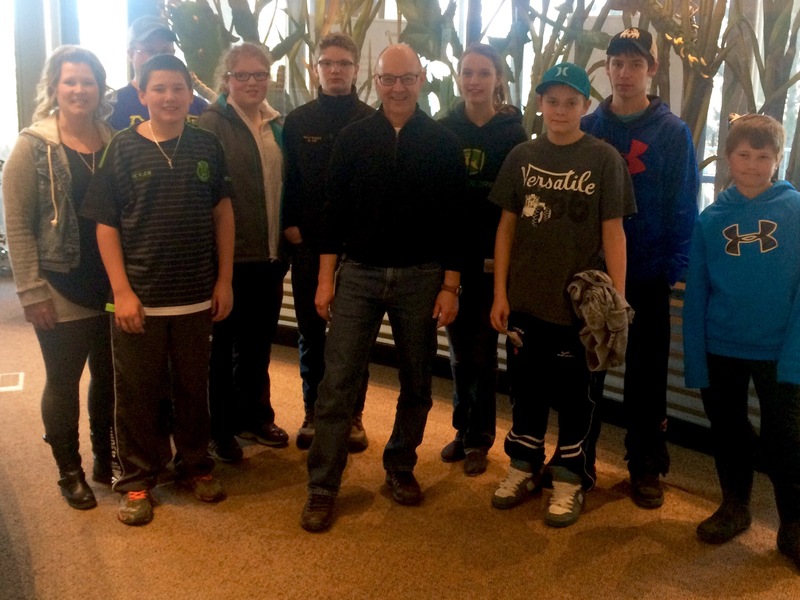 A group photo with our great tour organizer before we leave the AG Canada building. After a quick lunch sponsored by Wheatbelt Sales we were off to meet our student ambassador Lauren at the University greenhouses. Here they do a lot of disease resistance work especially in pulse crops (pulse crops are peas, beans, chickpeas and lentils). 2016 happens to be The Year of the Pulse Crop. 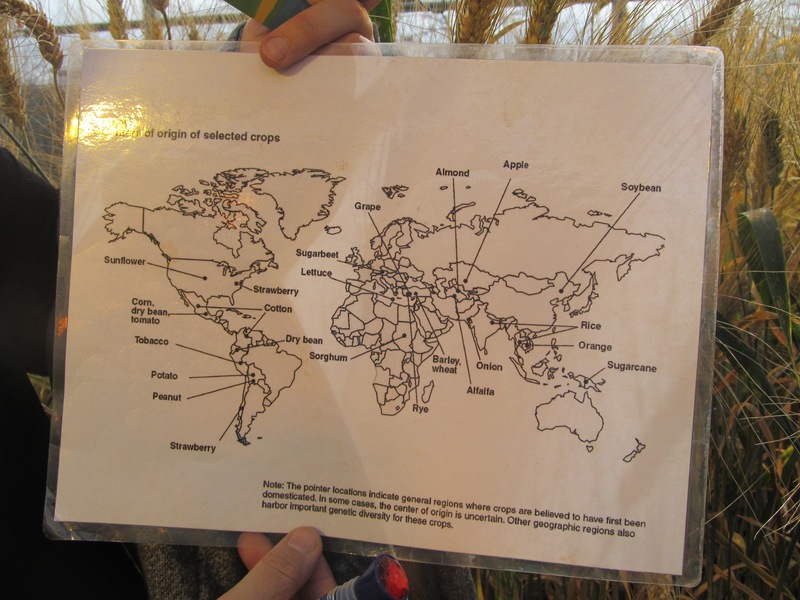 In this picture we are discussing what crops are ‘native’ to different parts of the world. This was interesting to me because just a few weeks ago I was told by someone not involved in agriculture that if all the farmers just grew crops native to their area then we wouldn’t need biotechnology, fertilizer, or chemicals to farm. Although this chart implies Canadian farmers would be able to grow nothing by that misguided standard, we did decide that Saskatoon berries might pass the ‘native’ to Canada species test. 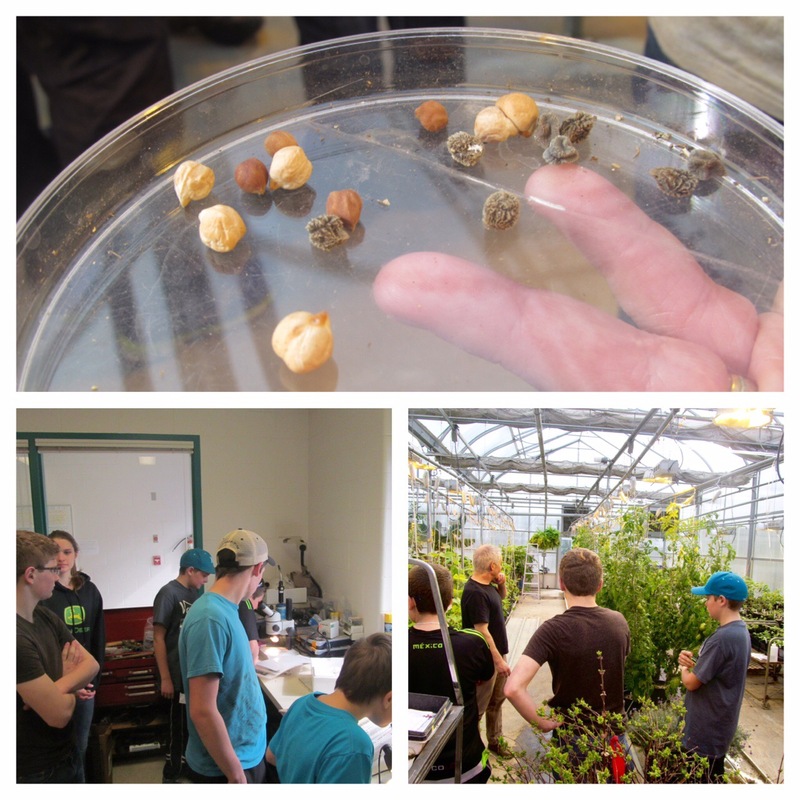 In the pictures above Eldon Siemens, the Agriculture Greenhouse Technician, is showing us the changes in chickpeas over the 2000 years they have been farmed, aphids in the microscope, and the university horticulture clubs current project. There was so much information to take in during this part of the tour that I could never cover it all. 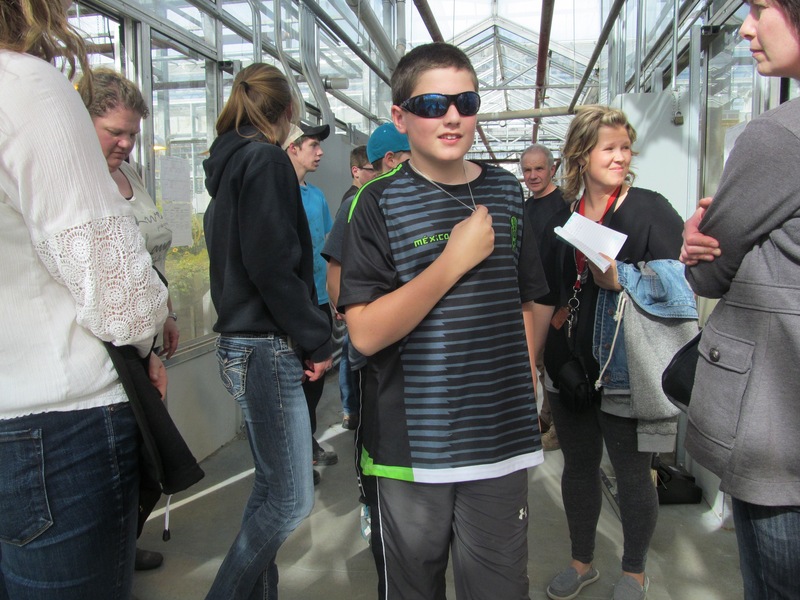 I was happy Eldon chose to discuss the cost of building, maintaining, and operating a greenhouse. It was pointed out to the students that where we live (in a cold climate), the environmental footprint is actually smaller for a cucumber shipped from the U.S. or Mexico than it would be to grow it in a greenhouse here. 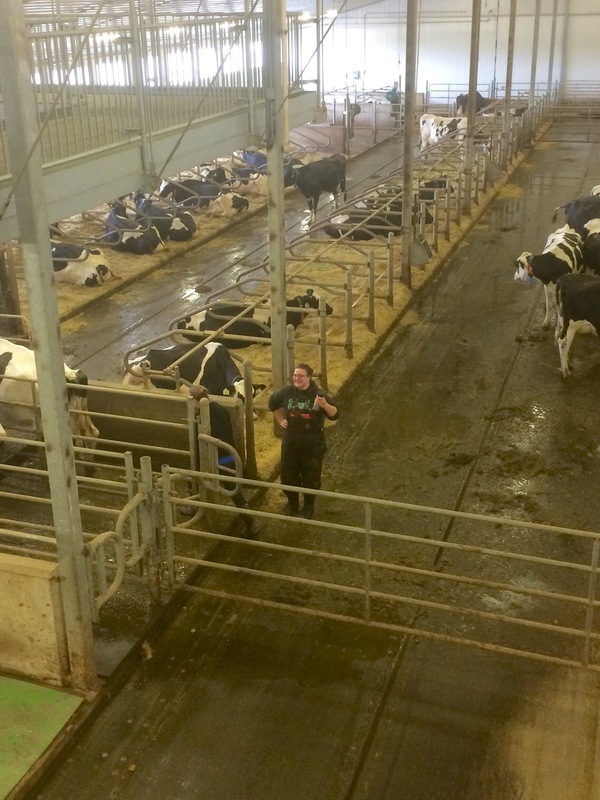 Here we are nearing the end of our day with a quick stop in to visit the 11.5 million dollar dairy barn and we happened to see a familiar face! Bonus points for anyone who can name this lovely lady…. 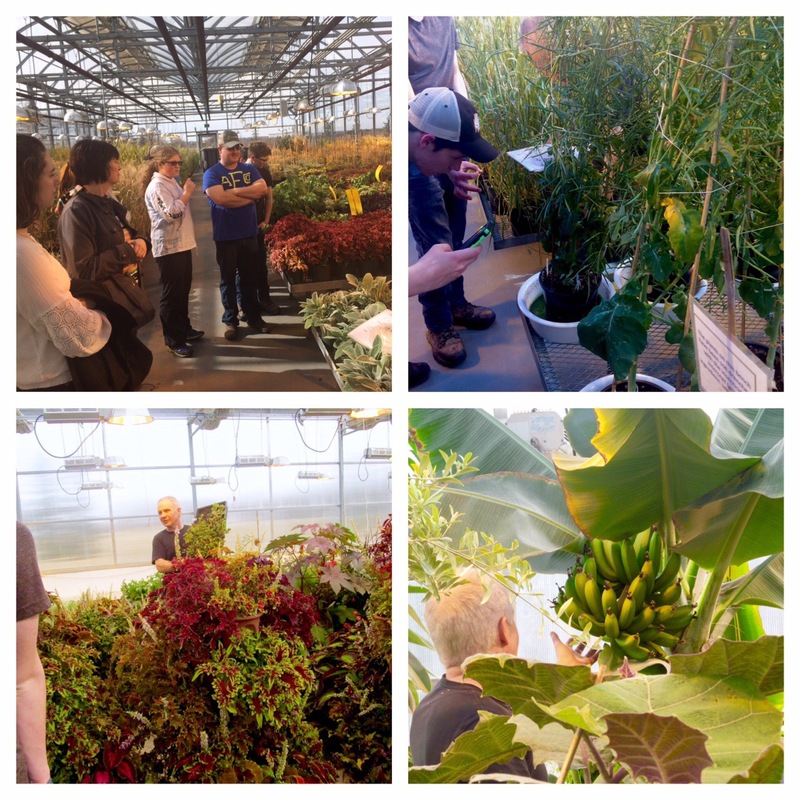 Our last stop was to see the university’s Controlled Environment Facility (aka Phytotron). The university has 183 chambers to use in plant experiments. Some of the students thought we should rent one and grow an orange tree, apparently it has been done here before. All in all I would call the day a success! Not only is it important for young farmers to understand and respect our partners in agriculture who help us combat pests and environmental challenges through science, but it is also important for them to learn about the opportunities in Agriculture past the producing level. The relationship between the academics and producers in agriculture will have to strengthen going forward as we struggle to communicate our challenges with the rest of the population. 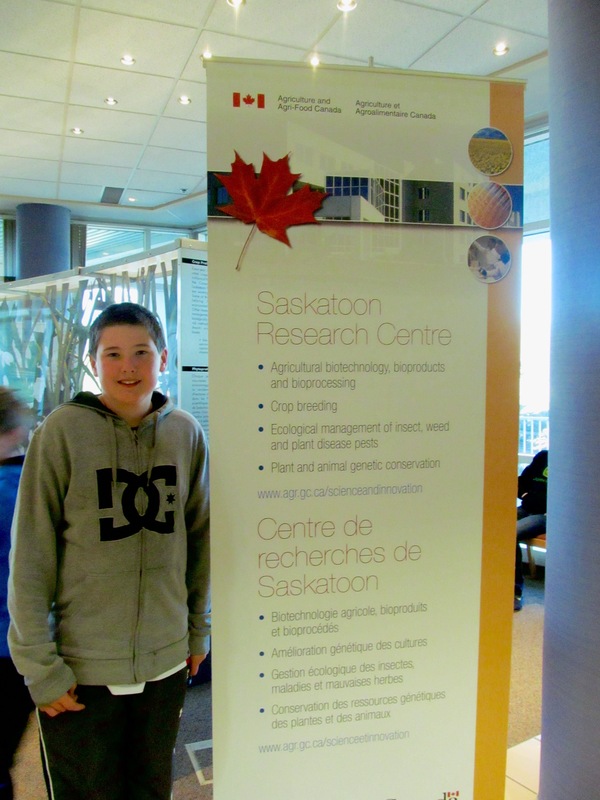 Thank you to everyone from Ag Canada and the U of S who helped teach our inquiring young minds. Even the not so young minds thoroughly enjoyed the day of learning!